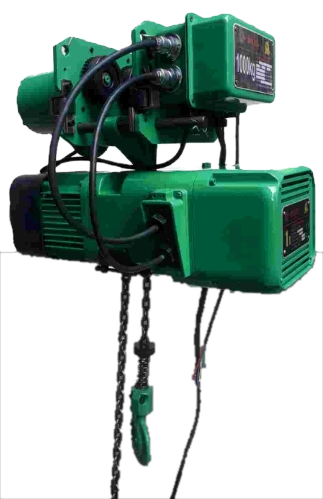 SPEED Chain Electric Hoist, strives to be the industry leader, in safety, longevity, and ease of maintenance. Trusted all over SPEED, continues to innovate and improve its chain electric hoists in order to offer an even more reliable. Aluminum cover for good heat dissipation. Can be used in severe environment due to it's sealed cover. 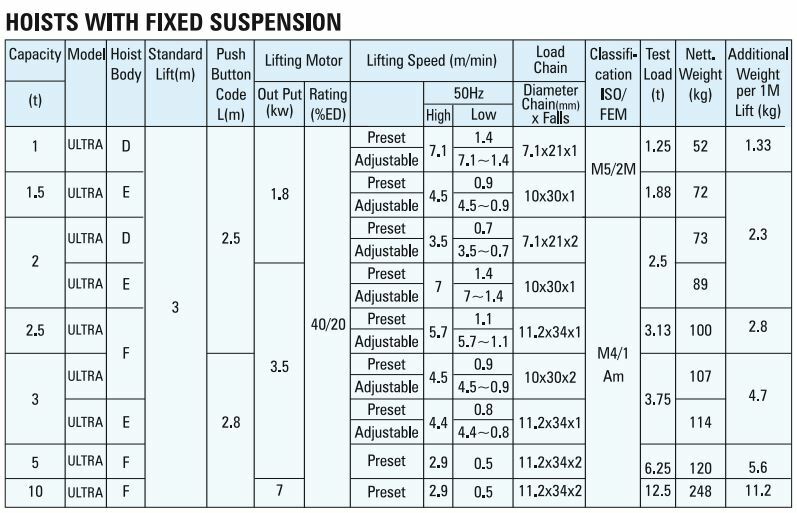 Anti-phase protector: the hoist will not work when connected to wrong power supply. Low- profile upper and lower limit switches provide excellent headroom. With safety voltage 24V / 36V device : if electric leakage occurs, an accident can be prevented. Brake device gets activated immediately. if there is a power cut. Light, beautiful and strong chain bag. Heat treated, premium, Alloy steel, Japan FEC GRADE 80 load chain. Unique controlling inverter enables immediate start up, stable speed and overload protection and monitoring. Aluminium Die-cast Body: Designed with strength and stability in mind, the body is both lightweight and tough. Chain Container: Made of durable canvas. Push Button Control: New ergonomically designed, It is easier to use, has greater durability and is included as standard equipment. 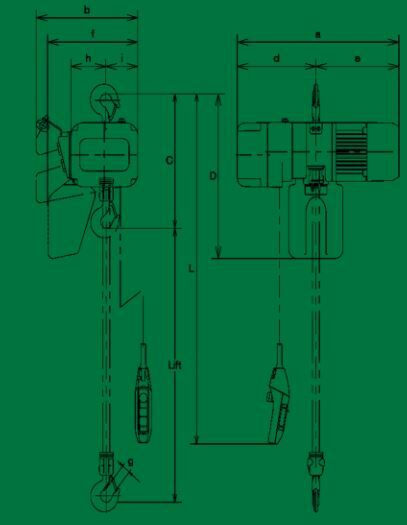 Bottom Hook: The load hook is fitted with a safety latch and can swivel 360, reducing kinking and twisting of the load chain. External Motor Fan: The aluminium die cast motor frame with external motor fan cools the hoist during heavy use. Electromagnetic Brake: The electromagnetic brake generates strong braking forces and hulls the load securely. Thermal Motor Protector: A sensor reduces the power, in case of overheating. Chain Guide: SPEED unique design chain guide for smooth chain feeding. Gearbox: Helical gears offer a smooth and silent operation. Friction Clutch: Developed by SPEED, as an overload protection. 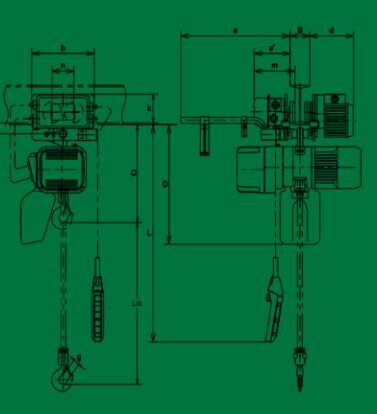 which interrupts the transmission of power from the motor, in case the hoist is overloaded. Direct Wiring: Easy to connect and disconnect using special internal connectors. CH Meter with Integrated Inverter: The LCD - Displays and counts. 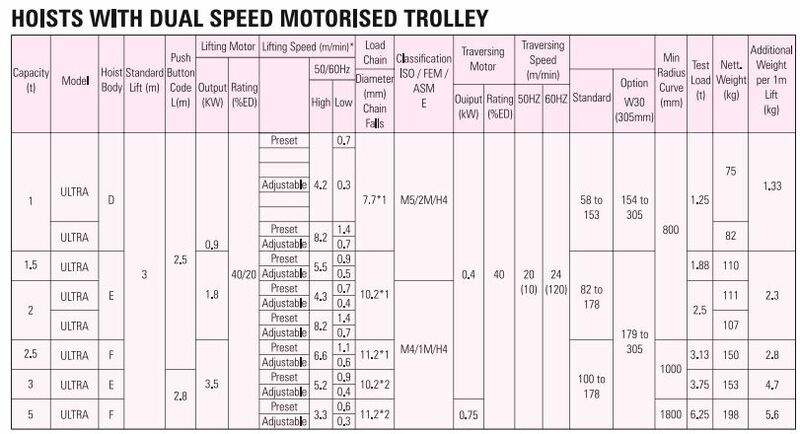 the number of lifting cycles and operating time. With the help of the displayed data, inspection and replacement intervals can be effectively controlled.